Sui Generis classification granted by Lambeth Council, confirming the Tavern as a combination of pub, nightclub and performance space. First and second floors defined as ancillary to the business needs of the pub – and thus protected against development into private accommodation. Please read to find out what’s going on and how you can help. 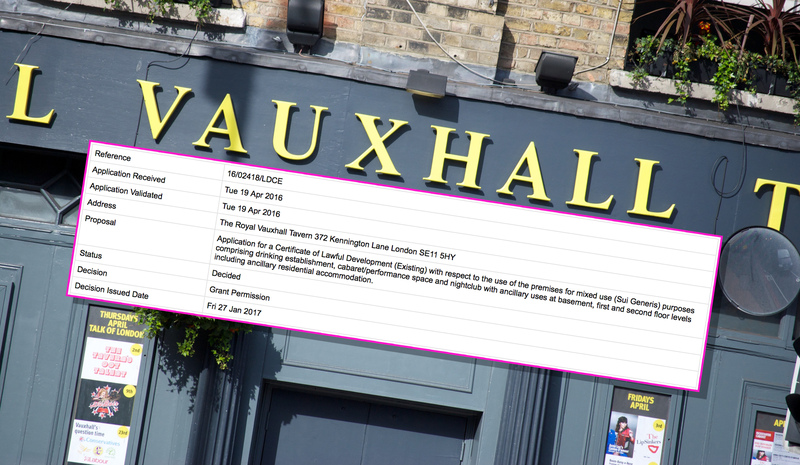 Following a huge effort from RVT Future and the wider LGBTQ+ community last summer – including the submission of 600+ representations, over 1,000 pages of emails, and around 2,000 file attachments – Lambeth Council have now granted Sui Generis classification to the Royal Vauxhall Tavern. This planning classification enshrines the Tavern’s unique usage as we know and love it. For decades, the RVT has been not simply a pub, nightclub or performance venue but all three, with every part of the building serving these functions. Lambeth’s classification makes this official, meaning anyone seeking to use the site differently – including turning upstairs space into private flats – will now have to fight for planning permission. Lambeth’s classification decision was made based on use of the RVT over the last ten years, and will last for a minimum of ten years. It is a significant development – but one that does not yet secure the future of the Tavern for the LGBTQ+ community. Due to RVT Future’s relentless efforts over the past two years, the Tavern is now effectively locked to its current use by four legal forms. Firstly, Asset of Community Value (ACV) status extinguishes any Permitted Development Rights; secondly, the Vauxhall Conservation Area has been extended to include the RVT site; and thirdly, any attempts to change this new Sui Generis classification is against Lambeth’s published planning policy for pubs within the area. Finally, the Historic England Grade II listing protects the fabric of the building. This quadruple lock confirms the Tavern as “London’s worst development opportunity”. Lambeth Council’s verdict simply would not have been possible without the staggering amount of evidence submitted by the wider LGBTQ+ community. It took months for Lambeth to sift through, made even trickier when a Freedom of Information request was received and acted upon halfway through. Thanks go to the RVT’s promoters, performers and punters, and to Lambeth Council for their sensitive handling of the application. Before we explain the Sui Generis classification in detail, we need to relate this decision to the Tavern’s current situation. The Royal Vauxhall Tavern is on the market. Christie & Co are selling the company on behalf of Immovate, as a business and not as a venue (you’ll see why this is both frustrating and important in a moment). RVT Future have reached out to both Immovate and Christie & Co to ask if they intend to activate the Asset of Community Value (something they are obliged to do should they intend to sell the venue). So far, they have not informed Lambeth Council of their intention to sell the venue and to activate the ACV. We can therefore only assume that they have no intention of doing so, which is why they are selling the shares of the company that own the venue. A sneaky work-around that, in our opinion, doesn’t sit within the spirit of the law. This makes Sui Generis ruling on the upper floors extra important. No potential buyer can now sell off the upstairs for private accommodation (something which has threatened the existence of many late night venues in London). The Royal Vauxhall Tavern also sits within the CAZ (Central Activities Zone) meaning business and employment space should take priority over housing. This, coupled with Lambeth’s policy on protecting pubs, should make it even more difficult for any potential purchaser to profit from the property market. The upper floors, including flats, cannot be used or sold for private accommodation – they are now officially recognised as ancillary to the Tavern. This is great news, meaning that planning permission would be required to turn these spaces into separate accommodation – something RVT Future would fight every step of the way. Use of the Tavern must be balanced between these activities. So Immovate couldn’t just parachute a chain pub into the space – the Tavern isn’t necessarily open normal pub hours (or normal nightclub hours, either). Many events are ticketed, unlike your usual pub. Many events are free, unlike your usual nightclub or cabaret venue. And any new owners putting on karaoke once a week would not come close to reflecting the documented performance use of the Tavern over the last decade. This mixed use is crucial to the Sui Generis status RVT Future applied for and have been granted, and something Lambeth Council will be watching closely. The RVT is unique. There was no simple classification for the Tavern because its unique form is what the LGBTQ+ community has made it. Lambeth Council sensitively and thoroughly reviewed our mass of evidence to take into account the unique way that the LGBTQ+ community uses the venue. It is this use which has made the Tavern beloved and distinctive enough to earn its new Sui Generis classification. What happens if someone wants to buy the Tavern and change it? Any changes would now require a Lawful Development Certificate, which would be assessed against policy and with material considerations taken into account. Currently there is a clear night-time economy policy surrounding the RVT – Lambeth are safeguarding public houses and protecting night-time economy uses. In short, it’s highly unlikely that the Council would grant a change of use. We call on Immovate to engage with the spirit of the law and activate the RVT’s Asset of Community Value status, should they intend to sell it. We are now ready to launch a community bid and look to Immovate to engage with us and Lambeth Council to move forward. More details about the RVT Community Society to follow shortly.